This year (2006) marks the 100th anniversary of Lee de Forest’s Audion or first vacuum tube triode (Figure 1). This was the most famous of de Forest’s 180 patented inventions. This vast improvement upon John Ambrose Fleming’s valve changed the world like few other events since. FIGURE 1. A photo of de Forest’s Audion, the first vacuum tube triode. The “valve” was a vacuum tube diode that Fleming invented as a modification to an Edison light bulb by adding a second element to it. 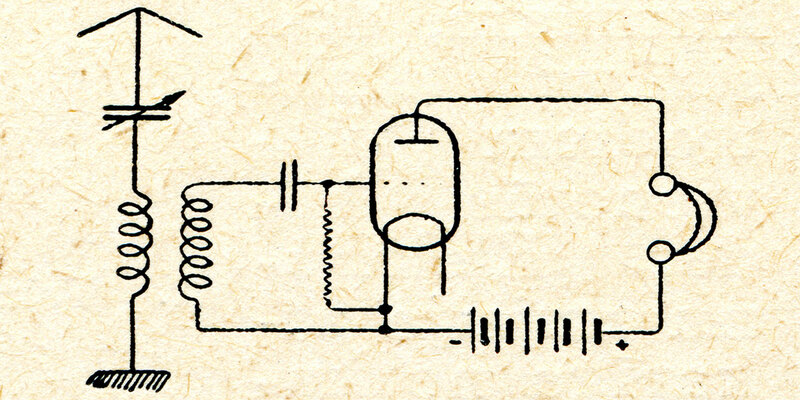 Lee de Forest’s triode or “Audion” as he called it ushered in the age of radio and electronic communications. The Audion detected radio signals, and then it could amplify them to produce audio. Finally, it served as the basis of an oscillator for the final transmission of signals. This era of early radio was one in which only a few visionaries and promoters realized its great potential, and this fostered ferocious competition and frequent legal battles. The significance of de Forest’s invention was at least two-fold. 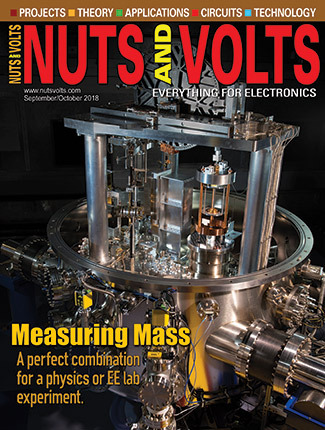 First, it allowed control over the stream of electrons between the tube’s cathode and anode, which is the basis of electronic communications, as just explained. 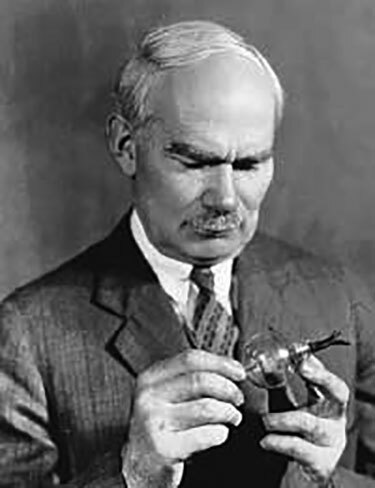 Secondly though, this invention inspired and planted the seed for further improvements to a whole bevy of vacuum tubes and related devices, including the cathode ray tube, X-ray tube, photomultiplier tube, and klystron. 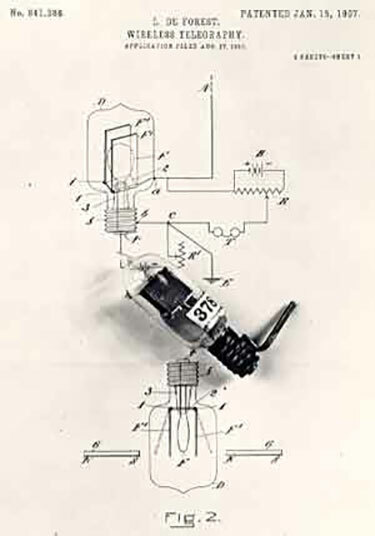 The following site shows a chronological timeline of inventions relating to vacuum tubes, and later television http://inventors.about.com/library/inventors/bl_television_timeline.htm. The earliest crude forms of the vacuum tubes appeared in the late 17th century. However insufficient technology, including efficient vacuum pumps, advanced glassblowing techniques, and the Ruhmkorff induction coil prevented them from being more than a “laboratory curiosity.” Incidentally, this coil standing alone could produce sparks more than one foot in length. 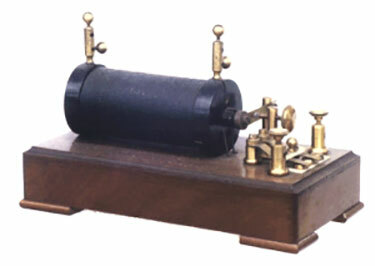 The first radio transmitters used such a coil (see Figure 2). FIGURE 2. The Ruhmkorff induction coil, an integral part of early attempts to make a vacuum tube. Lee de Forest inspired inventors, like Irving Langmuir, to produce spin-offs of the triode vacuum tube. Langmuir was a physicist and chemist who promoted a better understanding of plasmas, heat transfer, and thermionic phenomena. 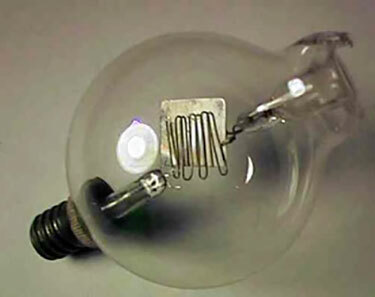 This allowed Langmuir to invent a high-vacuum electron tube and gas-filled incandescent lamps. Langmuir invented the first high performance practical gas-filled bulbs. A common myth is that Edison invented the light bulb. Edison just improved upon a 50-year-old idea. In 1879, Edison used a small carbonized filament in a vacuum inside a glass enclosure or envelope to produce a more reliable light source. But Langmuir, a name most people have never heard of, really invented a far more useful, optically-efficient device. One account of the significance of this discovery attributed to it was a savings in America’s lighting bill of $1,000,000 a night. This was especially welcome since it occurred in the middle of the Great Depression. After graduating with a Ph.D. from Yale, de Forest had numerous jobs related to his education and interest in electronics. He preferred to be his own man, however, and never worked with any one company very long before striking out on his own. His interest in yet-to-be-invented scientific devices was a tough sell in the business world, though, since his “products” did not yet exist. Lee was a personable man who appreciated the performing arts, especially opera. In fact, newspaper accounts tell of him sending the voices of opera singers to members of the press stationed at receiving sets as a way to promote the medium of radio, which was still in its infancy. de Forest also fostered amateur radio by making broadcasts that many hams would receive. One broadcast of historical merit was his coverage of the Hughes-Wilson Presidential election returns in 1916. This actually preceded what many believe was the first radio broadcast in 1920 by KDKA in Pittsburgh. Interestingly, de Forest became very vocal in the 1950s, over his remorse over what radio had become since he referred to himself as the father of radio. He felt radio was only comprised of second rate jazz, sickening crooners, and constant interruptions for “sales talk” — as he called commercials. 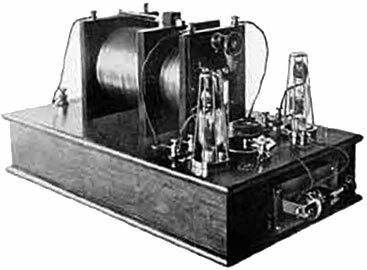 de Forest briefly worked for the Federal Telegraph Company in Palo Alto, CA while he was perfecting and promoting his Audion vacuum tube as an amplifier (Figure 3). FIGURE 3. The actual sketch submitted by de Forest (patent application) for his Audion. The telephone company used it in transcontinental phone calls, but it was cost-prohibitive for the average person. It would cost over a week’s pay (at the time) for just a few minutes. de Forest received $50,000 for this invention. By his own admission, de Forest spent the happiest 30 years of his life in Hollywood, where he died at the age of 88. Appropriately so, because de Forest’s second most notable invention was adding sound to motion pictures. He called this invention the “Phonofilm.” It added a synchronized sound overlay to film. This significant feat earned him an Oscar from the Motion Picture Arts and Sciences foundation in 1959 for this 1920 invention. However, the Phonofilm was not the system used in the famous talkie movie The Jazz Singer. The de Forest process used a device called a light valve to expose a series of dark and light patches right on the film’s sprocket edge. A photocell read these areas and converted them to sound with a great success of being in synch with the picture, see Figure 4, Lee de Forest in his mid-age admiring his audion. FIGURE 4. 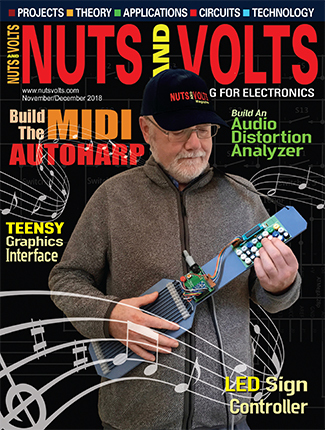 A middle aged Lee de Forest admiring his audion. By 1916, the Audion was the basis of an oscillator for the radiotelephone transmitter for experimental broadcasts in New York City. By now, de Forest’s Audion vacuum tubes had emerged into two large Oscillion vacuum tubes that he used as generators of RF (radio frequency) current. Figure 5 shows one of de Forest’s earliest radio transmitters made with Oscillion vacuum tubes. FIGURE 5. An early Lee de Forest transmitter using his Oscillion vacuum tubes. 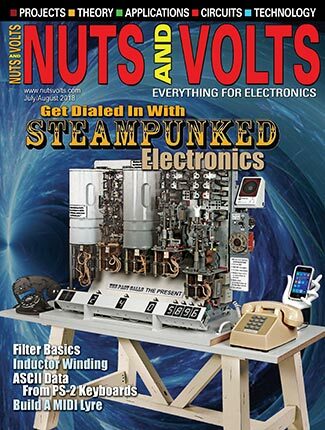 The early radiotelephone transmitters before 1916 were not based on de Forest’s Audion vacuum tubes. Virtually all early broadcasters of voice and music used some version of the Poulsen DC arc. 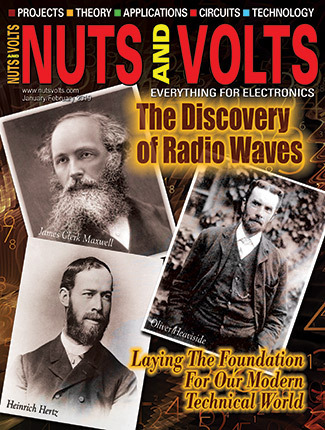 Generating high frequency signals in radio’s infancy assumed a number of innovative forms. Duddell accomplished this with an arc light as the power source to continuously excite and, in turn, cause oscillations in a tank or parallel-tuned resonant circuit. But it was Valdemar Poulsen in 1906 who invented the first practical arc transmitter for transmission work. Poulsen may be best known for inventing the first magnetic recording that he demonstrated in principle around 1898 in what he called his “telegraphone,” which was actually a magnetic wire recording. This was the precursor of tape recording. de Forest’s life was not without controversy, as four wives and expensive litigation attests to that. His first marriage lasted less than a year, then a year later he married a liberated electrical engineer who was not at all content living in his shadow. His third wife was a singer, Mary Mayo, and 18 years later he married his last wife, Maria Mosquini, an actress. She was his favorite by his own account, and they spent his last and happiest years in Hollywood. de Forest was frequently accused of unethical business practices. In 1903, when visiting fellow inventor Reginald Fessenden’s lab, he observed Fessenden’s Liquid Barretter detector and purportedly stole the idea. After three bruising trials, Fessenden finally prevailed and received an injunction against de Forest for patent infringement. In 1902, de Forest aligned himself with Abraham White (a Wall Street promoter) and they formed De Forest Wireless Telegraph Company. They approached the War Department and the US Navy, and had a public stock offering. Unfortunately, the actual value of the radio equipment sold did not match the hype of the promoter. Discredited, de Forest went on trial with two other promoters who were found guilty of misleading the public in the stock offering. However, de Forest was acquitted. de Forest did realize one early victory in 1904 by successfully demonstrating a wireless telegraph station to the US Navy in San Juan, Puerto Rico. This was with a valve (diode vacuum tube), since he had not yet invented his triode. In 1909, de Forest eventually sold his arc radiotelephone systems to the Navy. To test them, he played a record on a wind-up phonograph. Much to his pleasure and surprise, wireless ham radio operators intercepted his test signals. After successfully completing the test phase, de Forest equipped the Navy fleet’s lead ship, the U.S.S. Ohio, with one of his arc transmitters and a wind-up phonograph. During an around-the-world duty cruise between 1907 and 1908, de Forest accompanied his equipment aboard the U.S.S. Ohio and successfully communicated with Mare Island on the other coast during June of 1908. There were many ups and downs for de Forest, but his most famous legal battle was when he and Edwin Armstrong both simultaneously claimed they invented the regenerative or negative feedback principle of the Audion. This allowed feeding back weak signals at the tube’s output to its input to strengthen the signals. FIGURE 6. 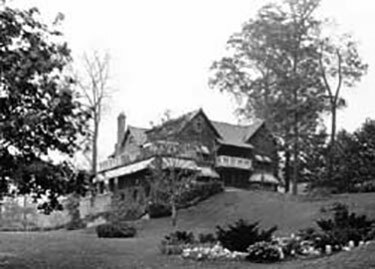 Lee de Forest’s palatial estate on the Hudson River that he lost due to numerous lengthy litigations.